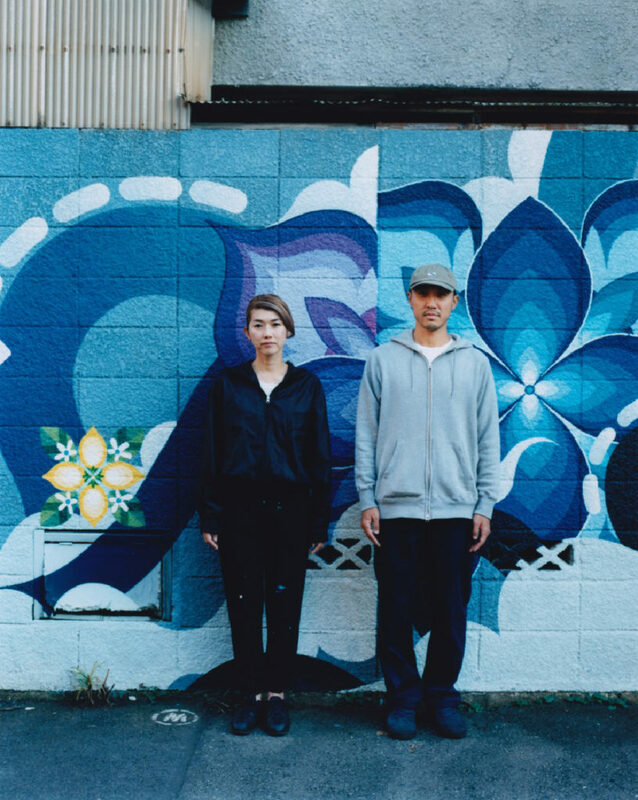 The unit HITOTZUKI (the sun and the moon), which consists of the artists KAMI and SASU, began a joint production in1999, and began fullscale mural production with its participation in the New York artists group BARNSTORMERS in 2000. The duo were originally active individually as artists in their own right. Through painting using his distinctive strong, smooth lines, which are neither characters nor concrete images, KAMI has expanded the potential of street art in Japan and has continually been a driving force behind the scene as a skateboarder and street artist since 1990s, primarily in Tokyo. On the other hand, the work of SASU who creates unique geometric designs that take fruit and leaves as their motifs, is characterized by a delicacy and use of color color unique to women, and thanks to her unique stance, she has been involved in the male-dominated street art scene. Their murals are completed by freehand, painted directly onto the wall. The name HITOTZUKI, which signifies the sun (hi) and the moon (tsuki), is a fusion of two opposing elements: male and female, yin and yang, plus and minus. It incorporates the meaning of creating a single, harmonious world. The new scenery that this couple creates express the feeling that arise from their everyday life, as well as their hopes for the future. They are together in their creative work and their life as a family, and their very lifestyle as they createthe shape of the future is a work by HITOTZUKI. While trying to sublimate simple, everyday beauty and joy into expressions, the duo, who live as partners even in their private life, believe even their lifestyle as a couple to be a work of art; they are pursuing their lifestyle and art from all angles and sending it out into the modern world. Copyright © HITOTZUKI All Rights Reserved.